Pretty and Witty and Fey: My New Bike! I have been wanting a new bike for the longest time. I seem to have a weird problem with bringing bikes with me when I move. They always seem to be given away as though they are too much trouble for me to bring along. I do not actually have to do any of the moving as the Navy takes care of that but something compels me to just give them away as though shedding a skin. 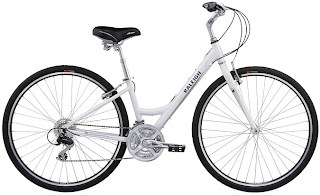 My dream bike is the Raleigh Passage 4.5 - I love its simplicity. I just cannot justify spending $400 on a bike that I may or may not use. So I happened across this little gem while perusing at my Navy Exchange the other day. It made me do a little double take and then I found myself just loving it some more. I knew I had to have it when I came home and immediately started talking about it. Eric spared me a lot of time by just going to get it for me. Love him! So now I just need to get a helmet that fits my humongous cranium and find a beautiful wicker basket for the front, and away I go! By the way, the dream bike will be mine one day! Oh yes, it will be mine. What to Bake? What to Bake? !